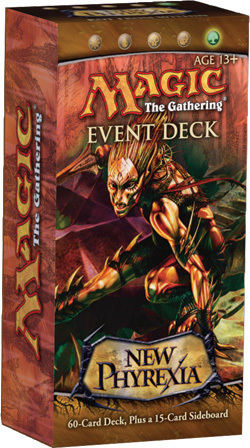 All Geeks Rejoice: Leak Sauce #15 New Planeswalker, New Phyrexia Event Decks, and a New Format? Leak Sauce #15 New Planeswalker, New Phyrexia Event Decks, and a New Format? Leaking info to you and bringing the discussion. A new challenger approaches! Kiora Atua has been previewed for Magic: The Gathering - Duels of the Planeswalkers 2012 and the official MTG Twitter has gone on to confirm her as a new Planeswalker. 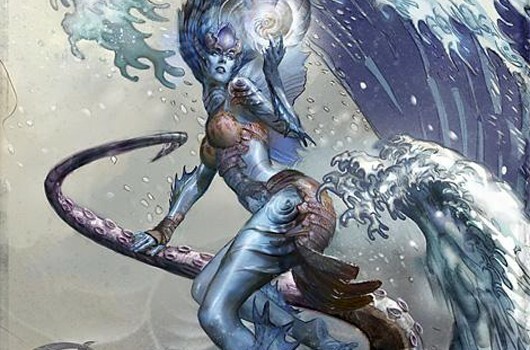 The blurb from the preview: Kiora Atua is a "female merfolk who commands the powers of the tides and depths." She sways dominion over the older creatures of the sea -- such as krakens and leviathans. This actually tells us a LOT about Kiora herself. We can discern that she is in fact Blue/Green and her artwork (tentacled beastie in the water with her), decklist, and the blurb posted all tell us that she isn't like Nissa in the slightest (that is to say: she isn't a tribal supporting Planeswalker - thank the blind eternities!). Her powers involve the ocean itself and the control over the massive cuddlies of the sea (and possibly the Great Old Ones which means my bud Cthulhu is totally pleased right now). There is zero pointing toward her being in Innistrad (the upcoming block) but I'm hoping it's true because I'm already intrigued over here. This has got to be not only the greatest Mono White Weenie product I've ever seen but I can't imagine a better Equipment deck either (again, for a product that is). There are three main things to look out for when analyzing products like this: Value, Competitiveness, and Fun Factor. 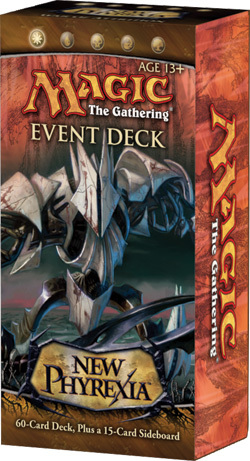 Value: This deck comes with two copies of Stoneforge Mystic which are worth $20 bucks a pop on their own. We're only analyzing two cards out of the 75 and we've already made profit. That's a steal! That's not even considering the fact that there's plenty of high quality cards in here at all rarities. Competitiveness: The mana curve here is fantastic with most creatures being at 1 or 2 CMC. The Living Weapons on their own can be a bit mana intensive but Stoneforge Mystic and Puresteel Paladin help negate that fact. Plenty of Double Strike and First Strike fills the deck which always gets nasty with equipment. Bone Hoard and Dread Statuary punish board sweep while Kemba, Puresteel Paladin, and the Mystic bring along ridiculous card advantage. To round things out, Leonin Relic-Warder, Journey to Nowhere, and the sideboard options (Celestial Purge, Kor Firewalker, and Revoke Existence) give you a massive suite of support spells that can handle any situation whether it be problematic creatures, artifacts, enchantments, or even an entire color (sorry Red, you already lost). Fun Factor: This is always going to be subjective but I'd say this deck has plenty going for it in this regard. The sheer variety and versatility of the deck just sings out to me. It's a sturdy deck that provides plenty of interactions and it promotes synergy like a boss. I'm giving this one a 10 out of 10. I can't find any faults with it and it manages to impress me in a variety of ways. Value: Inkmoth Nexus and Green Sun's Zenith are the only cards worth anything but their combined total with the rest of the cards in the deck would in fact be worth the $25 price tag. It's not on the same level of value as its counterpart but it makes up for that in other ways. Competitiveness: This is easily the more powerful of the two decks. By simply making a few minor tweaks like taking out the slow and less useful Putrefax, this deck is ready to engage in fisticuffs with just about anyone. I also have to bring up the fact that this thing is crazy consistent which is always important. Fun Factor: Again, this is subjective and I realize that many will find this deck a blast to play with but I personally think the fun factor is lacking since the deck promotes only one strategy: swing with all of your creatures and then pump the one that gets by to win since you only need to hand over 10 poison counters. And let's face it: That's the best infect strategy there is. I'm giving this one a 9 out of 10. It's worth its price tag and it's a worthy infect deck but it doesn't try to go above and beyond. Full details beyond this door here. Modern Magic isn't a paper format yet but I think we can all agree that Magic Online is definitely the right place to test this sucker out. It's basically Mirrodin and 8th Edition forward in terms of what sets are legal and it has a decent ban list to help smooth things out. I'm actually hoping this catches on as I'm an old extended fan and a huge supporter of the concept here. I don't have much else to say beyond the fact that I love the idea and I prefer this over the Standard format any day of the week. All of my play groups agree and it's literally what we already go by in terms of set legality. Make it happen! This is Kylak signing out after being bombarded by more delicious MTG news. As always, share your thoughts below.